This end-of-the-month series has a funny way of sneaking up on me. On one hand, scheduling a One Little Word review on the last day of every month has forced me to take inventory of my progress toward calm, but on the other, I forget about it. As I sat before a blank screen earlier today, I mentally reviewed the last thirty days. Emotions were all over the place. One week we were rejoicing our risen savior as kids played under the bright spring skies, and a week later the same skies spit out a violent tornado that broke the heart of Arkansas. It's been a tough one, and I can't begin to fathom what it's been like for those actually affected. They stay in my heart. As for me and my own calendar, April was packed. It may not seem that way from the outside looking in, but my schedule is tight. Between working out of town, raising three small people, and running the youth program for church, I can get busy. Most of the things I do, however, I enjoy, which leads to the problem of taking on more than I should. I love getting things done and I love helping people, but sometimes I say "yes" when I know I shouldn't. Moral of the story: I'm learning. Twice this month I checked my calendar, I weighed my reasoning, and I said "no." These favors were both easy and enjoyable, but it was extra, uncompensated work. This would have meant time away from my family that I simply wasn't willing to give. Declining an invitation sounds like a simple solution, but it's a big realization for me. In order to maintain a calm, clear head, I have to know how much I can handle. And I cannot feel bad about admitting my limits. Like I said in my update last month, I can't afford to run myself ragged. Sometimes I have to opt out. And that's okay. Say "no" when it's too much. As often as I forget about this One Little Word promise I made to myself, the lessons I'm learning are pretty worthwhile. 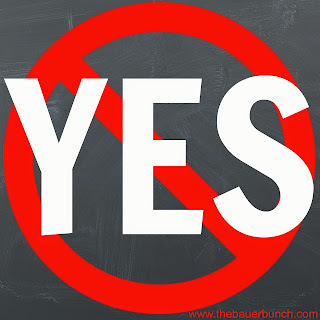 The best thing I've figured out about that last one is the more I say "no" when I mean it, the more often I can say "yes" to those who matter most. Have a wonderful Wednesday, y'all!